Built in 1923, the Pine Grove School is a wood-frame, one-story rectangular gable-front building with a V-crimp tin metal roof. 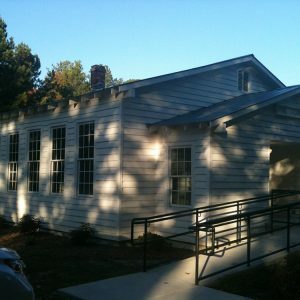 The layout of the Pine Grove Rosenwald School is a variant of the typical Rosenwald two-room schoolhouse. The common characteristics of this school plan included the orientation of the building, light colored paint schemes, and large banks of tall narrow windows. These particular elements were aimed at providing proper ventilation and optimal natural lighting inside the school, features that many early-20th century African American schoolhouses lacked.